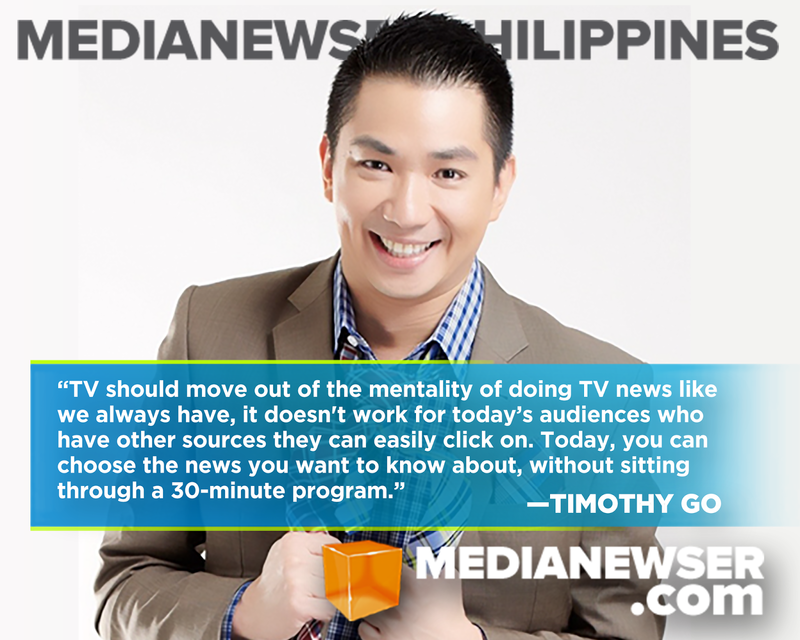 Timothy Go has been covering the news for almost two decades. His no-nonsense and straightforward "just talking" approach in storytelling, has been serving viewers from all across Asia through his programs First Look Asia and That's IT Uploaded on Channel NewsAsia. A Filipino who grew up in Manila and Vancouver, Go eventually traveled to the U.S., Hong Kong and then Singapore to pursue a career in television news — a lifelong dream of his ever since he saw the news coverage during the final years of the Marcos era. "I came of age in the early to mid-80s when the country was about to go through a political transformation," recalls Tim. "It was a great time to be in the Philippines and living through it. I was still a kid then but I watched many of our brave TV journalists then, taking on the establishment when they can — and I thought that’s what I want to be." In 2001, Go joined the then-newly established Channel NewsAsia, a place which became his television home for more than 15 years. "I was young and bold and wanted something new," says Go of the news channel. 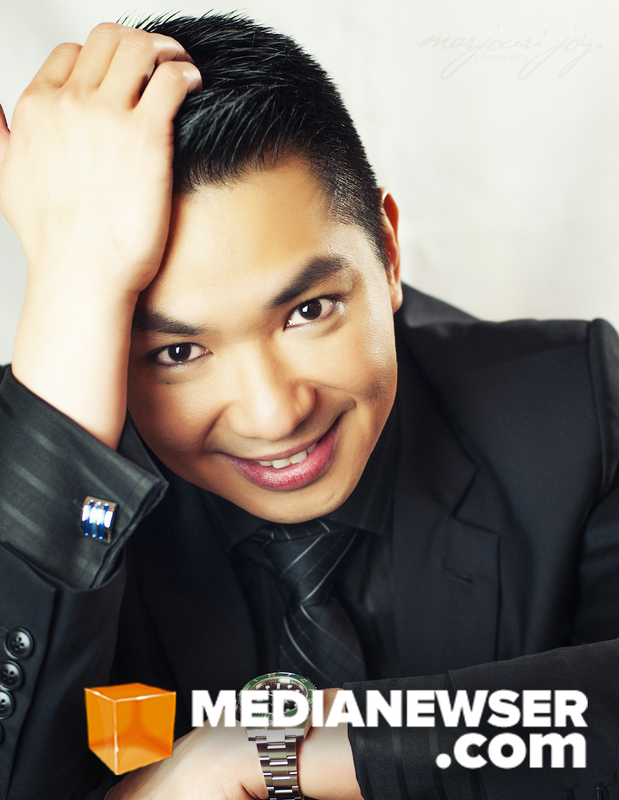 "Channel NewsAsia was one of two which offered me a job, and I took the opportunity to grow with them back then. Both the network and I were just starting out and it was a great partnership." 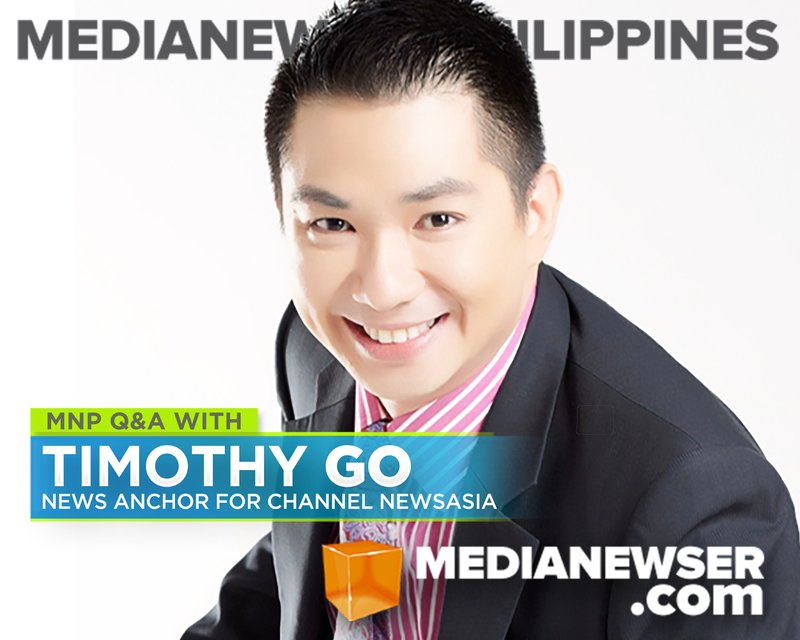 For this edition of MNP Q&A, Asia's premier news anchor Timothy Go spoke to us about his celebrated career as a journalist, his future plans of joining the Philippine TV news industry, and his thoughts on reporting in this new digital age. Be sure to be part of the discussion by tweeting us @medianewserphil or posting your comments below or on our Facebook page. Let's make a bit of introduction: Who is Timothy Go both on cam and off cam? Timothy on cam ranges from serious to quirky fun. I may seem stern if the topic requires me to be, but I can be as easy going as any conversation or story. Off cam I am totally just me, easy going. I came of age in the early to mid-80s when the country was about to go through a political transformation. A strongman becomes weak, the people wanted to be heard, and everyone from the political opposition thought they had the momentum. It was a great time to be in the Philippines and living through it. I was still a kid then but I watched many of our brave TV journalists then, taking on the establishment when they can — and I thought that’s what I want to be. After almost two decades of being a journalist, what keeps you from going? What motivates you? Bills need to be paid, my lifestyle needs to be supported and I need to earn a living — the best way to do that is to do what you like. Journalism is what I like, everything about it except the lower chance of getting rich. Tell us what drew you to Channel NewsAsia. I was young and bold and wanted something new. Channel NewsAsia was one of two which offered me a job, and I took the opportunity to grow with them back then. Both the network and I were just starting out and it was a great partnership. You were able to cover many major news events — Yolanda, the snap election in Bangkok, the London Summer Olympics, etc. — what would be the most memorable for you? Yolanda was my first major, large scale disaster. I was sent in to anchor segments of my then-show, Primetime Asia, closer to where the action was. Typically during disasters it is hard to get to places where you have to be. For the one week or so I was in the Philippines, I co-anchored the news every night, and running around searching for stories to tell before the show. This marks the first time Primetime Asia was anchored from a disaster zone. The London 2012 Olympic games is also memorable because I have always wanted to broadcast from the Olympic Games. I had just two weeks notice before the opening ceremonies. I told my boss then, instead of just reporting, I would be better off appearing on my then-show Primetime Asia every night anchoring the sports segment, and that was exactly what I did. It was the first time CNA broadcasted Primetime Asia live from an Olympic venue. You've done a wide variety of reporting: from national to international; to consumer to technology. Where are you most interested? I fell into technology by accident. Back in the early part of this century, most IT magazines had a female model posing with gadgets, so one of our producers suggested having a guy host an IT show instead. I was very much a techno-himbo back then, so the show really followed my journey from a techno-himbo, to a so-called IT expert that I am now. But deep inside I am a political animal and politics and international affairs are my strongest points — taking them in, digesting them, and reporting them for everyone to understand. Everyone who sees my report would identify with the story and how it affects them. Directly or indirectly. I think my job is to make sure what we report is relevant to our viewers. You can report about political scandals but if that doesn't make life for ‘every Juan,’ any better, then it is just entertainment. From international world leaders to major players in politics, tech and entertainment, who are your most memorable interviewees? I was fortunate enough to meet Steve Wozniak, the co-founder of Apple, and Michael Dell, the founder of Dell Computers. They were both wonderful tech geeks at heart. Listening to them talk about their passion and not so much the money making part of the business is refreshing. Normally when you talk to CEOs it is all about the bottom line. These guys have so much passion in what they are doing. I've interviewed many politicians and sad to say, politicians I've interviewed are only interested in furthering their own agendas. In entertainment, I was most impressed with Alicia Keys. I interviewed her when she was the global artistic director of Blackberry, and though I thought she was just a celebrity spokesperson, the woman really knew her stuff and the work she was hired to do. What makes somebody a good interviewer? I think a good interviewer is one who lets the interviewee talk, and not try to show off his/her own knowledge of the topic. We all do our research and that’s only to call out the interviewee if there is something inaccurate. There are many interviewers who show off their knowledge instead of listening to the one being interviewed. How do you handle a bad interview? Care to share us any experiences, if there is? I roll my eyes. There are some interviewees who are there to push for their own agendas. There are those who say a lot but say anything at all. And there are interviewees who do not provide any insights. There are also those who calculate the interview and use it as an opportunity to send the message out and still be a compelling interviewee. I've seen them all. There is no one way to handle a bad interview, and when it is live, I just sit there and keep asking my questions and hope that one will hit the right spot. Who do you want to interview next? Hillary Clinton. There are so many things I’d like to talk to her about. I want to know if her love of country is real, or is she running purely for political ambition. Before Channel NewsAsia, you also had a chance to work at Canadian Broadcasting Company and CKWX-News1130. Any memorable experience from working on those two networks that you'd like to share to our readers? When I was at the CBC, I worked on a now-defunct show called Pacific Rim Report. We did a series on the Philippines just months before and after Joseph Estrada became president. I was lucky enough to get an on-air position at CKWX, I was still in school then when I was offered to anchor the overnight news and report at night — I was so excited to be the first in my class to land an on-air job even before graduation. The 2 years there helped me become the reporter that I am today. A skill I thought I had forgotten until Typhoon Yolanda woke it up in me. You had been to Canada then the U.S., Hong Kong, and Singapore. How's it like to live that kind of nomadic lifestyle? To live a nomadic lifestyle is fun, you make new friends along the way, learn new things, and you have an opportunity to start life fresh. It is like a reformat or a reset. Though having said that — I don’t think my lifestyle is nomadic. Singapore has been my primary home for almost 15 years, longer than I was in Manila or Vancouver. What did you learn from living overseas? Independence and freedom when I first went to high school in Vancouver. You just have to learn to do things on your own, laundry, cooking, ironing, driving etc. Now that I am all grown up, I also learned to look at things from the outside, with a wider perspective of how I see things, and how I form opinions. Reporting news from Canada and Asia has taught me that humans just want a better life. With Channel NewsAsia, you pretty much cover anything and everything. But what for you is the biggest and most important story of the moment that the media should cover more? Definitely the OFW Phenomenon, not the just the maids and laborers in the oil fields, but also front line retail and service staff, hospitality staff, medical workers and professionals — their struggles, their stories, and the stories of those they have to support back home. Are their families back in the Philippines relying on their income alone? Why is the government still relying on OFW remittances to form 11% of GDP, why cant our government open up the economy so that more decent paying jobs are created? Why are we sending our best and brightest abroad, helping other economies prosper instead of ours? Can I copyright those ideas just in case I return and work in the Philippines someday? Aside from Channel NewsAsia, what news outlets or websites do you regularly read to stay informed and to understand what's happening in and around the world? Everything that is fed in my timeline, but the New York Times is my first go-to source on line. Who do you look up to among our local journos here? I grew up watching Tina Monzon-Palma, Noli de Castro, Mel Tiangco, the late Angelo Castro Jr, Frankie Evangelista, Harry Gasser, Cathy Santillan as anchors. I do admire local TV journalists in the Philippines, I think they work very hard, they love what they do, and it shows. And who are your closest journo friends here? RG Cruz and I go a long way and we click just debating politics and policies. Michael Josh Villanueva and I go around the same technology journalist pool when we cover consumer IT overseas, and we often try to work with each other when we are out there overseas. He shoots me, I shoot him. Ryan Chua, because we are both Tsinoys and he knows more about what the younger ones are interested in. Christine Ong and I worked a long time together on Channel NewsAsia and I had the privilege of being with her in Leyte in the aftermath of Yolanda, just before she resigned. And of course Maria Ressa, the one I turn to for career advice and wisdom. She’s the original Filipino journalist who worked for an international news outlet. I would like to meet more too, so hit me up guys! You wear many hats. You're not only a morning news anchor but also a TV host and editor. Why do you think it's important for journalists to be equipped with many skills? You can add social media journalist to that list, too. Apart from anchoring news night and day, reporting, hosting TV shows. Today, to be a successful journalist you just have to know how to do it all, and you have to be everywhere. If I can clone myself, I would do 3 of me just to cover everything. As a morning news anchor, you also have to be both hard and light news, and switching between each in a snap, all that time, engaging social media followers to tune in to the show. First Look Asia is pretty much a hard news driven morning program. Do you think the viewers of today want more news in an earlier time slot than the usual lifestyle segments? I don’t think they do, and we realize that. But there are some events that everyone needs to know before they start their day, so we try to give you the hard news, fast and easy to understand, so you are armed with what you should know to start your day — it helps make decision making, easier. There will always be lifestyle of course, and increasingly, what’s been trending on social media while you were sleeping, so we save you from having to scroll down your newsfeed to see what you've missed. You've been covering tech news for quite some time now. With the many innovations being launched from time to time, how do you determine which of them deserves to be featured on That's IT Uploaded? I test them out first, and if I am impressed, or disappointed, that’s what I will report on the show, after all this years I know what makes or breaks a device. The good thing is, the big manufacturers are listening to their customers and improving their offerings to suit customer needs. Just look at how smartphone have improved their selfie capabilities. You wake up early (you said 3AM) for First Look Asia and film for That's IT Uploaded for three days. That's a pretty hectic schedule. How do you find time for yourself and your family? At Channel NewsAsia, I am fortunate to have worked long enough to be given almost 40 days of paid vacation, and trust me I spend every single day making time for family and friends overseas. When I work I binge work for 3 weeks at a time, then I will take my holiday and switch off and just enjoy my time with family and friends – going back home or traveling. Tell us a bit about your family. How do they feel about your success? It started out with my parents not wanting me to do this kind of work, but I think I proved to them that I am good at it. Today, I consult my family for every career decision I make. The landscape has changed dramatically with digital/social media, and now, more and more people are getting their news online. What do you think will happen to traditional media (TV) 5-10 years from now? Do you think it will remain as powerful/influential as it is today? No, I don’t think so, unless we can come up with ways to give people a reason to watch TV news. For now, that reason can be your TV news personalities, 5 to 10 years from now, it could be different. TV should move out of the mentality of doing TV news like we always have, it doesn't work for today’s audiences who have other sources they can easily click on. Today, you can choose the news you want to know about, without sitting through a 30-minute program. We need to evolve and we need to do it fast. We need to widen the definition of news. I always say, I am in my middle ages and the industry I work in is in its twilight years. It may just soon retire. With the advent of social media, journalists are now more susceptible to criticism than ever. How do you deal with criticism? I always like a healthy debate. It is always good to know how others come up with their conclusion or criticism, and social media has given us an avenue to directly address viewer feedback. Just don’t tell me my lips are too red or my face is too white. Adjust your TV settings for that. What are your prospects for the upcoming 2016 elections, both in the U.S. and in the Philippines? I want to be involved in both. I hope I will be because it will be a fascinating year. What's your hope for the future? Is being part of the Philippine media something that would appeal to you? I would want to be part of the Philippine media to complete my cycle. Hopefully before I retire from this line of work. My future as a TV anchor is as uncertain as TV News future in an ever-changing world that is changing even faster now. If and when that happens, what will you remember and miss the most about your time with Channel NewsAsia? I will miss my almost 40 days of paid leave. I don’t think anyone in the Philippines can even come close to offering me that. And if ever there is one, please get in contact with me because I want to work for you. CNA has been very good to me, but almost everyone I worked for and with have all moved on to bigger and better things. I always joke with my former co-anchor on Primetime Asia to see who gets out first. I have been the longest serving anchor in CNA’s history having been anchoring for 14 straight years. What's the best advice would you give to those who might want to get into journalism? I hope I am remembered for my body of work, but I think they will only remember me as that anchor who wears vibrant ties that don’t always match. I don’t mind as long as I am remembered.